When designing a Turbine Inlet Air Cooling (TIAC) systems many factors have to be taken into consideration in order to design an efficient system in terms of electrical and water consumption. Bad choices in terms of Turbine Cooling plant design might affect to the plant long term operation and consequently to the project OPEX. ARANER has more than 20 years of experience designing and installing Turbine Cooling systems. 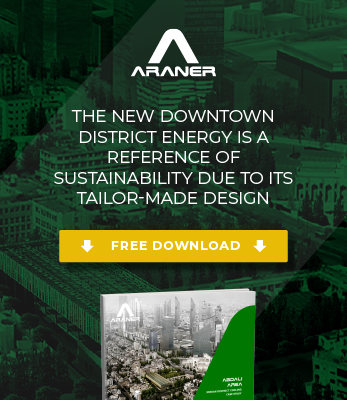 During these years, ARANER has gained knowledge experiencing different situations and investing resources to develop new and advance technologies better adapted to client needs. Have you ever wondered how to determine the right steps to achieve higher results? Today we would like to share the lessons we learned from past experiences to design a successful and efficient Turbine Cooling plant. The proper selection of the technology can be very profitable in terms of efficiency and reliability. For example, if seawater is available at site we could save a considerable amount of money in the long term run. Chilling plants using seawater instead cooling towers as heat rejection devices are more efficient in terms of electricity and water consumption. Even if the CAPEX for this solution is initially higher because seawater treatment and sea water corrosion resistant equipment, such as titanium, have to be installed, still the saving in energy when running the plant, are much higher. In case of the availability of sea water at site, it is needed a filtration system for the sea water circuit. The sea water can contain debris and/or sand and this can block the condensers affecting the efficiency of the chillers and even risking the equipment life. The filtration system must be properly selected to ensure the proper operation of the plant minimizing the plant maintenance cost. Based on ARANER experience on sea water condensation chiller, ARANER has designed a sea water treatment with self-cleaning filters and advanced electrochlorination systems that do not require chemical additives so the maintenance operations are very much simplified. In case of seawater is not available and a cooling tower has to be installed, then it is crucial to keep the open recirculation cooling water system clean all the time. The type of filter will depend on the environment, for example dusty areas such the desert must have high efficiency sand filters. Otherwise, the efficiency and also the lifetime of the system will be clearly reduced. In addition to the filtration system it is also required a chemical treatment. This kind of treatments protects the cooling tower from biological life growing and premature rusting. The chemical treatment and the filtration system are usually put aside, although they are very important in the operation and lifetime of the system. ARANER is committed to ensure that TIAC technology benefits all the stakeholders involves in the process. In this regard, it is very important to pay attention on how to deal with all scenarios and problems during the turbine cooling process. Several facility owners and managers have used TIAC systems and proven their value, but the most important issue is to have a reliable system with maximum efficiency and with all the quality tested. If you want to have more information or personalized advice by our expert engineers, Contact us for further information. If you enjoyed this post, you may be interesting in Turbine Intel Cooling Systems.